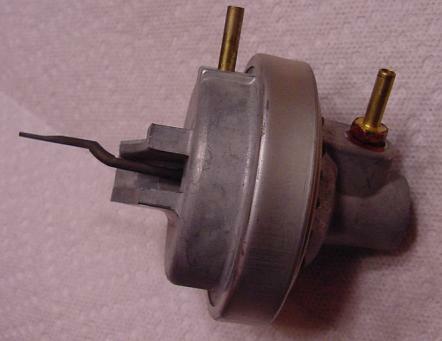 The 428 Super/Cobra Jet engine uses a distributor vacuum advance (Ford basic part number 12370) that adjusts ignition advance in response to changes in engine vacuum. Both single diaphragm (with one vacuum port) and dual diaphragm (with two vacuum ports) advances were used depending on the type of transmission installed in the car. Cars equipped with an automatic transmission used a single-diaphragm advance and cars equipped with a manual transmission used a dual-diaphragm advance. 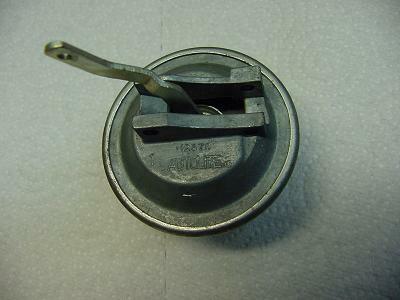 Dual diaphragm vacuum advance units use carburetor vacuum on the outer, primary diaphragm to adjust ignition timing in response to engine speed. Manifold vacuum is used on the inner, secondary diaphragm to retard timing during periods of closed throttle idle to reduce emissions. 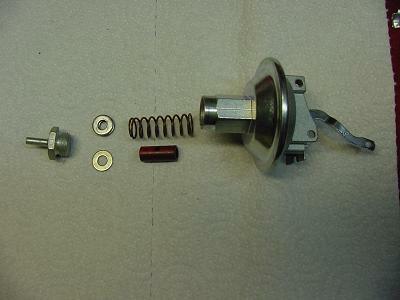 The secondary diaphragm is also used to control ignition advance in response to coolant temperature; see the distributor vacuum control valve page for details. 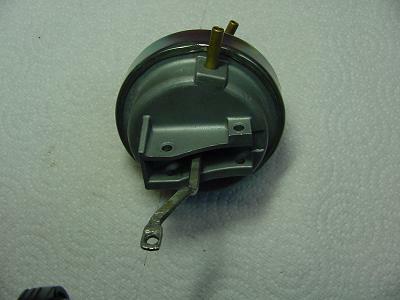 Single diaphragm vacuum advance units respond only to carburetor vacuum. 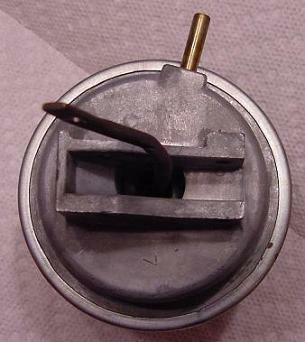 Note that the advance unit used for 1970 models with manual transmission used two different hose connectors for the outer port. Up through the end of October 1969, the unit came equipped with a screw-in hose connector. From November 1969 through the end of the model year the unit came equipped with a press-in hose connector. 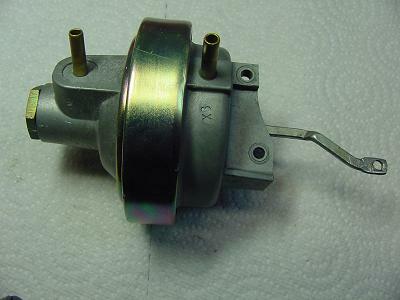 This same unit was also used during the 1971 model year on Boss 351s and 429 CJs and SCJs with manual transmissions, but a cast-in hose connector was used. The 1968-1969 manual transmission unit has an 9/16" wide silver-colored band and the 1970 units have an 11/16" wide gold-colored band. 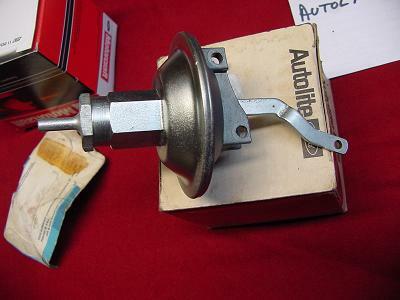 The advance used during the 1968 and 1969 model years on cars equipped with a manual transmission is a dual diaphragm unit that can be identified by its narrow silver band and "HP 6" mark. 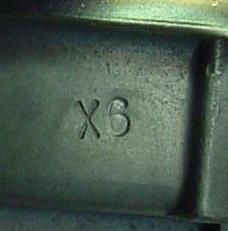 The engineering number found on the front of the dual diaphragm advances doesn't uniquely identify the advance, so it shouldn't be referenced for identification purposes. Apparently different castings with different numbers and "Autolite" markings were used. 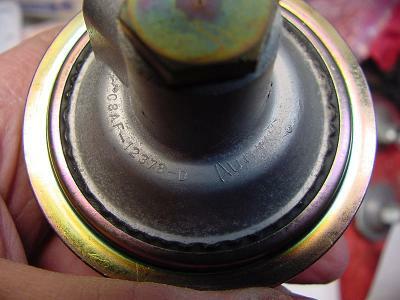 The advance used during the 1970 model year on cars equipped with a manual transmission is a dual diaphragm unit that can be identified by a wider (than the 68-69 band) gold (zinc dichromate) band and an "X 6" mark. 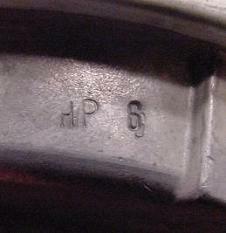 Here are close-up shots of the "HP 6" and "X 6" markings found on the dual diaphragm advances. Both the single- and dual-diaphragm advances are calibrated and adjusted using a combination of washers and a vacuum chamber spring that can be found under a plug on the front of the unit. Different springs were used for different applications, with lighter springs used in advances targeted for high performance vehicles. Adding a washer will decrease advance and removing a washer will increase advance. 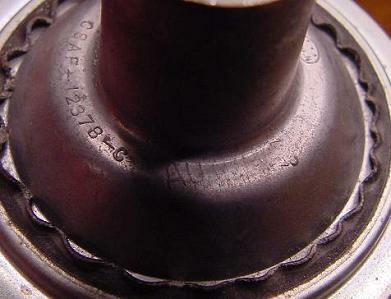 Adjustment procedures can be found in your factory service manual. Thanks to Tim O'Connor for the pictures used on this page.